Extra virgin preserves the most flavour and nutrients and that beautifully green tint. 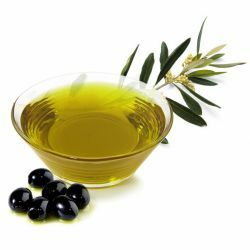 Other grades include virgin, pure, 100% olive and others. The oil’s composition makes it ideally suited to shield skin from free radical activity. It can help prevent discolouration and damage. Extra virgin olive oil is used in our Marilyn hair product, helping to increase the tensile strength of hair and gently treating the scalp. Our Gorgeous face moisturiser has a high content of extra virgin olive oil, adding to the perfectly balanced formula of easily absorbed, yet nutritious ingredients. Dream Cream is rich in extra virgin olive oil, creating a non-greasy formula to care for your skin. Extra virgin olive oil, which retains most of the active and health promoting properties, is used in our Lip Service lip balms with other tasty ingredients to make our balms lip-smackingly delicious and good for your pout, too.